Campaigns are an evolution of Battle Missions, offering you a set of special missions that need to be completed in succession. They'll teach newcomers important subtleties of the game while allowing experienced players to expand their horizons, and everybody can earn epic rewards. After fulfilling the mission's main criteria, Campaign missions have a seperate "final" task to complete in order to progress. Completing a mission's tasks earns pins used to unlock a final task. Any individual task is repeatable, and you get pins each time it's completed. You can have two tasks active at a time, or three if you have a premium account. Other rewards tied to tasks, such as flags, consumables, etc., are earned only once, regardless how many times you accomplish the task. If you fulfilled a mission's requirements in the battle, but return to Port and unselect the mission the mission interface before the battle ends, the fulfillment won't be counted. You'll get one big reward at the end of a Campaign. This reward will vary depending on Campaign. Science of Victory - Designed as a "beginner campaign" for newer players to level up their fleets while learning the game's fundamentals. Honorable Service - A short but complex campaign for experienced players to hone expert-level strategies, gameplay, and teamwork. The Campaign Map is available to players with Account Level 8 or higher. 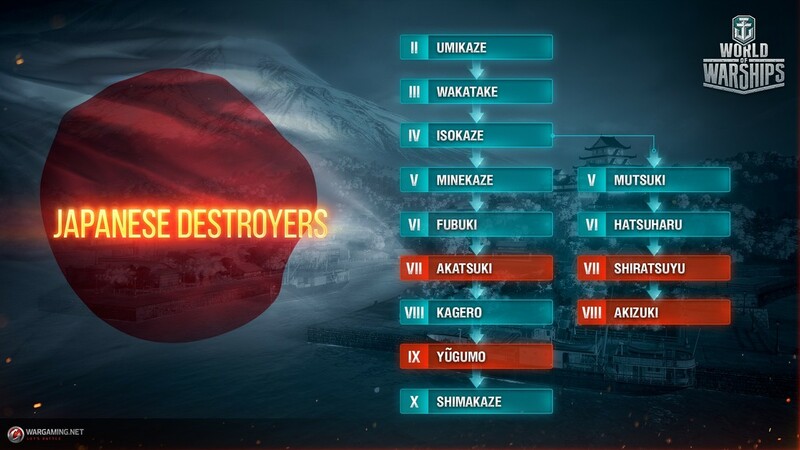 The Japanese destroyer tree is growing! There's new destroyers, tweaks to others, and a complete reworking of the tree. Check it out! 120mm Mk3 HE shell damage is reduced by 15%. Chances to set on fire were reduced from 8% to 7%. Type 6 torpedoes were removed. Players were required to research and purchase this module for further leveling up. However, this module had not provided any substantial increase in the ship's battle performance. 120mm Type 1 HE shells damage is reduced by 15%. Chances to set on fire were reduced from 8% to 7%. Main battery loading time increased (from 10 to 12 seconds). Torpedo speed reduced (from 68 to 57 knots). Damage by a torpedo reduced (from 14,400 to 10,833 points). Reload time of torpedo tubes reduced (from 47 to 42 seconds). 120mm Mk3 HE shells damage is reduced by 15%, chances to set on fire were reduced from 8% to 7%. Mutsuki was moved from Tier VI to Tier V, and her technical characteristics were significantly reworked. In fact, she became a new ship. Get the details here! Fubuki was moved from Tier VIII to Tier VI, and her technical characteristics were significantly reworked. In fact, she became a new ship. Get the details here! This new ship replaced Hatsuharu. Get the details here! Kagero was moved from Tier IX to Tier VIII, and her technical characteristics were significantly reworked. In fact, she became a new ship. Get the details here! This new ship replaced Kagero. Get the details here! 127mm Type 1 HE shells damage is reduced by about 14%, chances to set on fire were reduced from 9% to 7%. Decreased main guns' reload time from 7 to 6 seconds. Damage per minute is the same as it was in Update 0.5.14. This sub-branch includes Tier V–VIII ships. (Tier IX–X ships are added later; in Update 0.5.15, the last ship of this branch is Tier VIII destroyer Akizuki). New ships in this branch feature more powerful guns, less torpedo tubes (compared to ships in the standard branch), and the Torpedo Reload Booster consumable (available starting from Tier VI). These ships are for a more aggressive play style -- their main guns are quite decent in comparison to same-tier Soviet and American destroyers and enable players to more often engage enemies in open encounters. These changes were required to make her fit her new role. Moved from Tier VII to Tier VI, and her technical characteristics were significantly reworked. In fact, she became a new ship. Get the details here! These are brand-new ships -- get the details here (for Shiratsuyu) or here (for Akizuki)! If a player researched Mutsuki VI before the update went live, then Fubuki VI and Mutsuki V plus her Hull (B) become researched; the undistributed ship XP available on Mutsuki VI is be transferred to Fubuki VI. If a player purchased Mutsuki VI before the update went live, then all upgrades, signals, flags, and consumables mounted on her are de-mounted and stored in the depot; Mutsuki VI plus all modules mounted on her are removed from the player's account; Mutsuki V is added to the player's account together with a ship slot; Fubuki VI is added to the player's account. If a player researched Fubuki VIII before the update went live, then Kagero VIII, Fubuki VI, and Hull (B) for Akatsuki VII become researched; the undistributed ship XP available on Fubuki VIII is transferred to Kagero VIII. 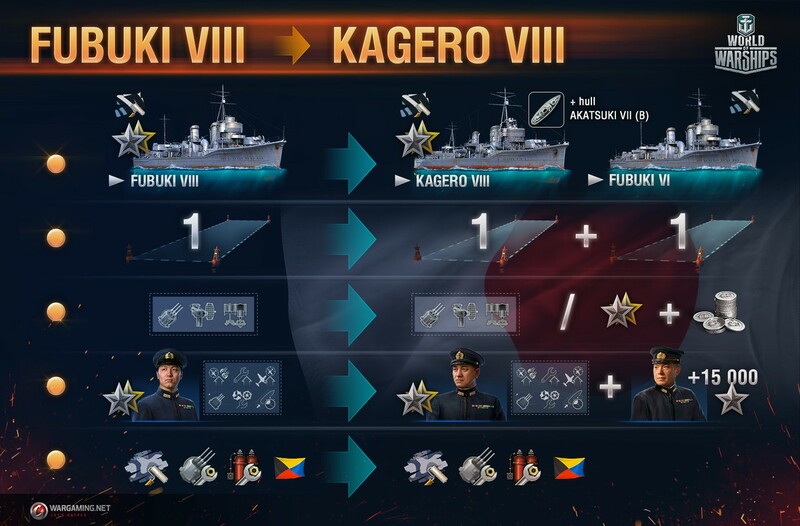 If a player purchased Fubuki VIII before the update went live, then all upgrades, signals, flags, and consumables mounted on her are demounted and stored in the depot; Fubuki VIII plus all modules mounted on her are removed from the player's account; Fubuki VI together with a ship slot are added to the player's account; Kagero VIII is added to the player's account. If a player researched Kagero IX before the update went live, then Yugumo IX, Kagero VIII and Hull (B) for Kagero VIII become researched; the undistributed ship XP available on Kagero IX is transferred to Yugumo IX. If a player purchased Kagero IX before the update went live, then all upgrades, signals, flags, and consumables mounted on her are demounted and stored in the depot; Kagero IX plus all modules mounted on her are removed from the player's account; Kagero VIII together with a ship slot is added to the player's account; Yugumo IX is added to the player's account. If a player researched Hatsuharu VII before the update went live, then Akatsuki VII, Hatsuharu VI, and Hull (B) for Fubuki VI become researched; the undistributed ship XP available on Hatsuharu VII is transferred to Akatsuki VII. If a player purchased Hatsuharu VII before the update went live, then all upgrades, signals, flags, and consumables mounted on her are demounted and stored in the depot; Hatsuharu VII plus all modules mounted on her are removed from the player's account; Hatsuharu VI together with a ship slot are added to the player's account; Akatsuki VII is added to the player's account. If a player researched Minekaze V before the update went live, then Mutsuki V and the "Gun Fire Control System, Type 4 mod. 2" module for Isokaze become researched. If a player purchased Mutsuki VI and Fubuki VIII before the update went live, then a bonus in the amount of 3,100,000 Credits is added to the player's account. If a player purchased Fubuki VIII and Kagero IX before the update went live, then a bonus in the amount of 9,040,000 Credits is added to the player's account. If a player purchased Mutsuki VI, Fubuki VIII, and Kagero IX before the update went live, then a bonus in the amount of 12,140,000 Credits is added to the player's account. If a player had Commanders with specialization in Mutsuki VI before the update, then the Commanders are retrained for specialization in Fubuki VI. In addition, a Commander with 10,000 Commander XP and specialization in Mutsuki V plus a slot in the Reserve is added to the player's account. If a player had Commanders with specialization in Fubuki VIII before the update, then the Commanders are retrained for specialization in Kagero VIII. In addition, a Commander with 15,000 Commander XP and specialization in Fubuki VI plus a slot in the Reserve is added to the player's account. If a player had Commanders with specialization in Kagero IX before the update, then the Commanders are retrained for specialization in Yugumo IX. In addition, a Commander with 35,000 Commander XP and specialization in Kagero VIII plus a slot in the Reserve is added to the player's account. If a player had Commanders with specialization in Hatsuharu VII before the update, then the Commanders are retrained for specialization in Akatsuki VII. In addition, a Commander with 15,000 Commander XP and specialization in Hatsuharu VI plus a slot in the Reserve is added to the player's account. If a player purchased the permanent camouflage for Hatsuharu VII before the update went live, this camouflage is removed from the player's account; permanent camouflages for Hatsuharu VI and Akatsuki VII are added to the player's account as replacements. If a player purchased the permanent camouflage for Fubuki VIII before the update went live, this camouflage is removed from the player's account; permanent camouflages for Kagero VIII and Fubuki VII are added to the player's account as replacements. If a player purchased the permanent camouflage for Kagero IX before the update went live, this camouflage is removed from the player's account; permanent camouflages for Yugumo IX and Kagero VIII are added to the player's account as replacements. Because every ship in the game has a unique set of modules, some modules may become outdated when the changes are made to the Tech Tree. Such outdated modules can either be replaced with equivalent modules (which is researched and purchased free of cost) for new ships, or be reimbursed with Credits and Ship XP. XP reimbursement is provided when the corresponding module was researched before the update went live. Credit reimbursement is provided for every module item mounted on a ship or stored in the depot before the update went live. Wakatake (Tier III) Type 6 torpedoes 1,600 Ship XP is added to Wakatake III, 95,000 Credits are added to the player's account. Mutsuki VI 120 mm/45 Type3 guns 4,200 Ship XP is is added to Fubuki VI, 320,000 Credits are added to the player's account. GFCS Type6 mod. 2 Equivalent module for Fubuki VI. Hull (B) for Mutsuki VI 4,800 Ship XP is added to Fubuki VI, 570,000 Credits are added to the player's account. Hull (C) for Mutsuki VI 7,300 Ship XP is added to Fubuki VI, 570,000 Credits are added to the player's account. Type 8 mod. 2 torpedoes Equivalent module for Fubuki VI. Hatsuharu VII Hull (B) for Hatsuharu VII Equivalent module for Akatsuki VII. Type 90 mod. 1 torpedoes Equivalent module for Akatsuki VII. GFCS Type 7 mod. 2 Equivalent module for Akatsuki VII. Fubuki VIII Hull (B) for Fubuki VIII 14,000 Ship XP is added to Kagero VIII, 1,100,000 Credits are added to the player's account. Hull (C) for Fubuki VIII Equivalent module for Kagero VIII. 127 mm/50 Type 3 guns 10,000 Ship XP is added to Kagero VIII, 850,000 Credits are added to the player's account. Type 90 mod. 2 torpedoes 18,500 Ship XP is added to Kagero VIII, 1,600,000 Credits are added to the player's account. Type 93 mod. 2 torpedoes Equivalent module for Kagero VIII. GFCS Type 9 mod. 2 Equivalent module for Kagero VIII. Kagero IX Hull (B) for Kagero IX 21,000 Ship XP is added to Yugumo IX, 1,600,000 Credits are added to the player's account. Hull (C) for Kagero IX Equivalent module for Yugumo IX. Type 93 torpedoes 24,000 Ship XP is added to Yugumo IX, 2,200,000 Credits are added to the player's account. Type F3 torpedoes Equivalent module for Yugumo IX. GFCS Type8 mod. 2 Equivalent module for Yugumo IX. Say you're in a battle and start fighting alongside an ally who seems to be in perfect sync with you. In the back of your mind, you think they'd make a great friend for future fights, but then the battle ends. Did you get their username? How will you find them again? Dynamic Divisions addresses this. If you find that special ally, you can request to Division with them mid-battle. No waiting needed; no returning to your Port. Some missions will require you to be part of a Division to complete it. You need to be in a Division at the end of the battle in order to fulfill the criteria. If you're not in a Division by battle's end, it won't count even if you've satisfied other criteria. A Division with only one member that was created in the Port will now be removed when entering a battle. A Dynamic Division with only one member is removed after the battle. When Dynamic Divisions are created or dismissed, the corresponding notifications are displayed in the battle chat of the corresponding team. A Division Commander can lock the Division in order to accept players only when invited by the Commander. The Dynamic Divisions feature is available in Co-op and Random Battles. The maximum number of Divisions is six for Random Battles and three for Co-op Battles. An invitation to join a Dynamic Division is sent via the side team panel. The time delay between sending invitations to the same player will increase after each rejected or recalled invitation. Delay values: 15, 45, and 150 seconds. Players can disable receiving invitations to join a Dynamic Division via the "Divisions" tab (this setting is retained). A player can concurrently receive up to three invitations. After their ship is destroyed, a player is unable to carry out operations with Dynamic Divisions (except leaving a Division). During battles, a Dynamic Division is only created the quantity of Divisions on the opposing teams doesn't differ by more than one (which is a matchmaker condition). The internal voice chat feature works for Dynamic Divisions in the same way as it does for standard Divisions. Improved visuals of the permanent camouflage for cruiser Minotaur. Added permanent camouflages for Pensacola, Akatsuki, Yugumo, Shiratsuyu, and Akizuki. Premium ships will now be taken into account when a container is collected. If a container includes a Premium ship that the player already possesses, she is replaced by another randomly-selected ship. Moreover, if the player already possesses all ships obtained via containers, then they will receive a bonus (in Doubloons) equal to the price of the ship in the collected container. For promo ships, this bonus is fixed. For ships available for purchase, this bonus is equal to the current ship price (displayed in the game client) for the server (rather than the Premium Shop) in the corresponding region. Let's look at two examples of the ships available for purchase to understand how it works. You already have all the ships obtained via containers and have collected a container with Tirpitz. Tirpitz is currently offered at a 15% discount via the game client (irrespective of the Premium Shop). In this case, you will receive a bonus in the amount of her original price minus the discount: 10,625 Doubloons (rather than 12,500 Doubloons). You already have all the ships obtained via containers and have collected a container with Scharnhorst. Scharnhorst is currently offered at a 15% discount via the Premium Shop. However, there is no discount for her in the game client because she is not available for purchase via the game client in your region. In this case, you will receive a bonus in the amount of her original price: 9,500 Doubloons. In the Epicenter mode, sector boundaries will now be marked by neat solid lines. Improved the appearance of the "Saint Petersburg" Port as well as the landscape on the "New Dawn" map. Made slight corrections to landscape objects on the "Strait" map. Fixed various defects in the "Saint Petersburg" Port as well as on the following maps: Archipelago, Strait, Sea of Fortune, Polar, Mountain Range, New Dawn, The Atlantic, Trident, Neighbors, Estuary, and Shards. Destroyed ships “leaping” out of water. Incorrect behavior when several ships are destroyed in the same place. Small ships twitching when they were destroyed by ramming. Rotation of the ship's wreck when she was destroyed while maneuvering. Pensacola: for her top hull, AA mounts were added on top of the main turrets. As a result, her AA damage within the 2 km AA engagement area radius increased from 54 points to 61 points. Moreover, the position of the weapon group’s camera was corrected in order to account for adding these AA mounts. This camera will now be positioned slightly higher. Decreases the flickering of reflections when the camera is moving. Increases the quality of reflections when in the close-up view and adds missing reflections in the background. New ships for testing by developers and Supertesters. These ships are not available for research or purchase, but you might see them in battle! Fixed several rarely-encountered bugs where the game client could unexpectedly terminate during a battle. Fixed several rarely-encountered bugs where the game client could unexpectedly terminate when in the post-battle statistics screen and in the Port. Fixed a rarely-encountered error where, if the player possessed only tier I ships, a notification was displayed that there was not enough XP for researching a ship when, in fact, there was. Fixed no indication that a base or key area was designated as a target using the Quick Messages key (default: F3). Fixed Ranked Battles statistics screen not opened after clicking "Your highest rank this season". Fixed the detailed information about a combat mission was displayed incorrectly after switching to the Details view. Fixed, in the dynamic ship icon, the colors of the ship's HP bar and numerical HP value did not match. Updated the battle loading screens for some maps. Fixed an error with updating information about the auto-resupply of consumables when a player already has a certain quantity of them. Fixed the Containers screen was opened after the battle when the player entered this battle in a Division while this screen been active. Fixed a rarely-encountered bug where the game client hung in the process of loading into a battle. Fixed game client window hidden under the Windows taskbar after the window was minimized and maximized during a battle. Fixed a rarely-encountered bug on Intel graphics cards where there was a flickering black screen when MSAA antialiasing settings were changed. Fixed issue that caused the Commander skill point respec button inactive after needed amount of Doubloons is purchased. Fixed a rarely-encountered bug that caused game client crash if launched with old NVIDIA drivers. Fixed text in Modules tab in the Port. Fixed ship tier mark not fully displayed in the carousel in the Port. Fixed ship ropes not displayed against sky and water for some ships. Fixed reward multiplier not displayed correctly in the rewards window ("Honor to Heroes"). Fixed a ship not included in the previously set carousel filter in the Port. This page was last modified on 6 March 2017, at 19:16.